Anyway I'm learning to play slide guitar but the ball ache of re-tuning my guitar constantly and the strings being really close to the fretboard (i.e a low action) so the slide bounces off the frets. Makes it a pain in the arse. With that in mind I've sold my much loved but barely used "Cry Baby Wah Wah" guitar peddle for funds. I'm going to buy a cheapy acoustic guitar and with the magic of a soldering iron, some swearing and a lot of luck and maybe a hammer. 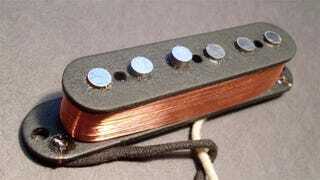 I'm going to merge a cool sounding bluesy pickup into the acoustic and make it an electric slide behemoth.